The 1980s were arguably the NBA’s best decade, giving rise to Magic Johnson, Larry Bird, and Michael Jordan. They were among the game’s greatest players who brought pro basketball out of its 1970s funk and made it faster, more fluid, and more exciting. Off the court the game was changing rapidly too, with the draft lottery, shoe commercials, and a style driven largely by excess. One player who personified the eighties excess is Micheal Ray Richardson. During his eight-year career in the NBA (1978–86), he was a four-time All-Star, twice named to the All-Defense team, and the first player to lead the league in both assists and steals. Richardson was also a heavy cocaine user who went on days-long binges but continued to be signed by teams that hoped he’d get straight. Eventually he was the first and only player to be permanently disqualified from the NBA for repeat drug use. In Sugar, Charley Rosen tracks the rise, fall, and eventual redemption of Richardson throughout his playing days and subsequent coaching career. Rosen describes the life‑defining pitfalls Richardson and other players faced and considers key themes such as off‑court and on‑court racism, anti-Semitism, womanizing, allegations of point‑shaving within the league, and drug and alcohol abuse by star players. Richardson started his career with the Knicks, and then had a brief stint with the Golden State Warriors before he was traded to the New Jersey Nets halfway through the 1982-83 season. Rosen writes of Richardson's 1983-84 season in New Jersey, "During that season, (Nets owner) Joe Taub called Richardson every single day to make sure his backcourt ace was clean. 'I'm cured,' Richardson would reply, even though he was back on the pipe. 'I was a celebrity once more,' Michael Ray recalls. 'Everybody likes a comeback story, so I was bigger than ever. Once again, I was hob-nobbing with the A-list - movie stars, politicians, internationally famous athletes. But once or twice a week, I was dashing up the stairs and swivel-hipping my way past nodded-out junkies on my way to score.' Still, his drug fog reduced his numbers to only 12.0 points and a 4.5 assists per game. "Judging by his performance in the Philadelphia series, Richardson's body had fully recovered. He was absolutely spectacular - averaging over 20 points, 7 assists, 4 steals, and dominating virtually every clutch situation. Even though, in Julius Erving, Moses Malone, Andrew Toney, Mo Cheeks, and Bobby Jones, the 76ers' roster featured five certified All-Stars and four future Hall of Famers, Richardson led the Nets to victory in the decisive fifth game in Philadelphia." Richardson played a couple more seasons in New Jersey before he was banned for life by NBA Commissioner David Stern. Rosen does a remarkable job of constructing his various lines of narration around the polarizing figure of Richardson, who was equally a basketball savant, drug addict, and pariah. 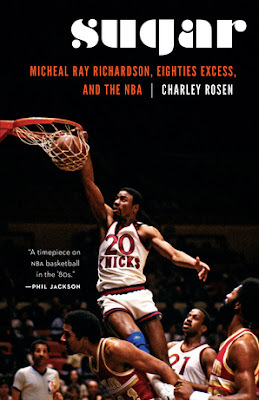 With Sugar, Rosen illuminates some of the more unseemly aspects of the NBA during the 1980s, going behind the scenes to provide an account of what the league’s darker side was like during its celebrated golden age.